There are two entries here. One is the original article, directly below. Number 2 is a related item about EUR, the section of Rome meant to open in 1942. Mostra d’Oltremare (1940. Var. architects, incl. 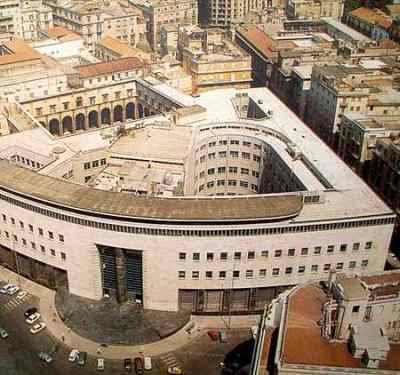 The best definition I can come up with for the “Architecture of Fascism in Naples” is “buildings put up in Naples in the 1920s and 1930s.” That, I realize, would be cheating my way around many definitions. With apologies, I am confused by the terms of 20th-century architecture: Bauhaus, International style, Art Deco, Constructivism, Organicism, Modernism, Functionalism, Futurism, etc.—and I have barely scratched the façade. (Most of those styles, by the way, dropped you down the elevator shaft if you tried to put so much as even one ornamental scratch on their façades!) One of the most confusing terms is the one given to much architecture in Italy in the 1920s and 1930s: Fascist Rationalism. It seems to combine two irreconcilable terms. First: Fascist. Mussolini’s call in the 1920s for a “Fascist style” produced many buildings in Italy inspired by past architectural glories. Among these were the “Imperial” style with Roman features such as columns and façades adorned with eagles; the “Palladian” style, with arcades, porticoes and arches without ornamentation; and the “Baroque” (endearingly called by the diminutive, barochetto) with ridiculous amounts of ornamentation dripping off the facades. All of that is an historical approach to architecture: using the past, as Mussolini said, “…to serve as a source of training and encouragement for the advancement of the aims of the nation.” You expect an architectural corollary; that is, Fascist Italy spent much of the 1920s excavating imperial Rome—the Theater of Marcellus, the Trajan Forum, the forum of Caesar, the forums of Augustus and Nerva. All these were opened and seen for the first time in 1500 years. The glorious past had been rediscovered; the new architecture should somehow reflect that. Second: Rationalism, the non-historical approach. Modern architecture was dedicated to the concept that form followed function, that ornamentation was a crime, and that—in Le Corbusier’s words— “a house is a machine for living." Rationalism meant science and reason, not history. How, then, to have a building that is both (1) historical and (2) rational, meaning that it should fit the functional "machine" aesthetic of the new architecture? Welcome to Fascist Rationalism. 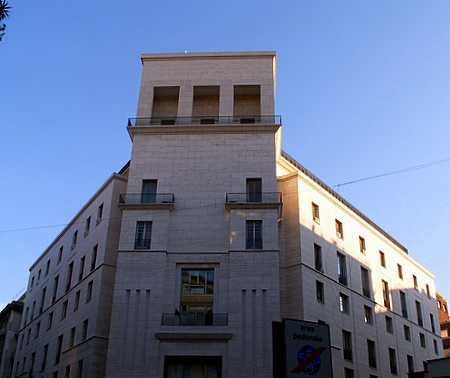 Some who write about the conflict of those two extremes in Italian architecture say that the modern school lost out to the historical school—termed “stripped Classicism”—by the early 1930s; thus, you might expect monolithic and useless temples erected to the power of the state. 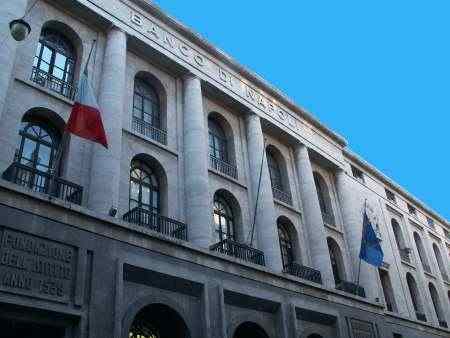 Many of the buildings in Naples from the 1930s, however, do not bear that out. Yes, they are obviously “Classical” (though “stripped” of ornamentation); yet, they are functional. 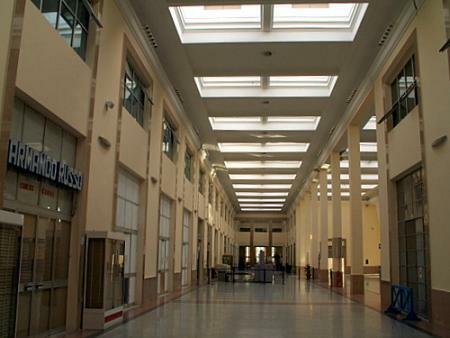 “Rationalist Row,” if you will, in Naples centers on Piazza Matteotti. There you have the main post office (see that link for interior photos); it looks like a marble and glass (and very functional) bee-hive. Indeed, the façade is a giant parabola with rows of small practical windows, behind which sat small practical drones who stared out at New Rome while they cheerfully misdirected your letters. But the interior has so much non-functional wasted imperial space that you could float your blimp in there while you buy stamps. One should note that the architects of the post office went to great ends to preserve an important bit of Neapolitan past by actually incorporating the courtyard of the old Mount of Olives monastery into the new structure (photo, below, right). 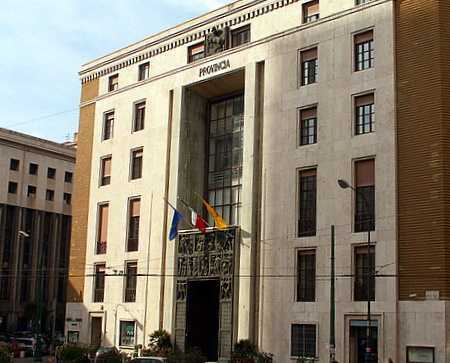 Nearby is the Provincial Administration building, called one of the outstanding examples of Rationalist architecture in Italy (photo, top of page, left). 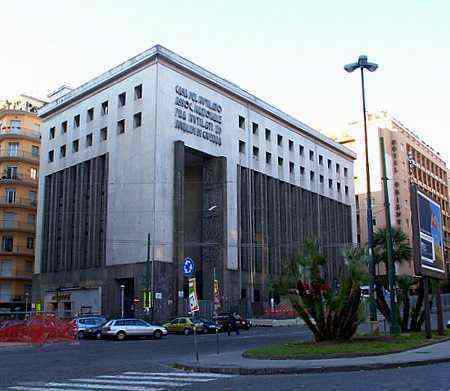 Across the street is the ANMIG (Wounded War Veterans) building; up at the corner is the Banca Nazionale del Lavoro and one block away is the Istituto nazionale delle assicurazioni (National Insurance Building). 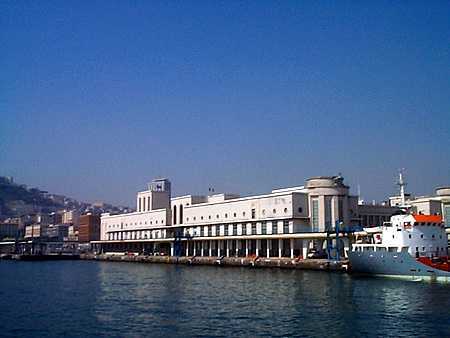 Elsewhere there are other examples: the passenger terminal at the port, the Bank of Naples on via Toledo (aka via Roma) and outside of Naples, in Fuorigrotta, the Mostra d’Oltremare (Overseas Fair Grounds). All of those sites were finished between 1935-40. Holdovers from the 1920s in Naples include the Cardarelli hospital—a weird mixture of a neo-Classical façade and a futuristic interior—and the Mergellina train station, solid barochetto, where the ornamentation is so syrupy that trains have been known to stick to the tracks. Cortesi, A. “Rome Architects Scrap Old Ideas.” New York Times, October 7, 1934. Doordan, D. P. “The Political Content in Italian Architecture during the Fascist Era” in Art Journal, Vol. 43, No.2, (Summer 1983). Ghirardo, D. “Italian Architects and Fascist Politics” in Journal of the Society of Architectural Historians, Vol. 39, No. 2. (May, 1980). Millon, H. “The Role of Architecture in Fascist Italy” in Journal of the Society of Architectural Historians, Vol. 24, No. 1. (Mar., 1965). Monotti, Francesco. “Architecture in Italy.” New York Times, November 1, 1931. Scolari, Margaret. “In the Triennale, International Style Triumphs.” New York Times, August 6, 1933. At least the Overseas Fair Grounds in Naples, the Mostra, (described above) got off the ground — barely. But it did open on time and had a successful, if very short, run before WWII spoiled the fun. The Mostra was exactly what it claimed to be: a boisterous bit of Fascist Italy beating her breast about her African colonies. It was, however, puny compared to the never-finished Mother of all Fascist Breast Beaters that was to be New Rome. That would be EUR, (pronounced in two syllables — a long A + oor, with the oo as in 'food'. Tack on an r of your choosing). 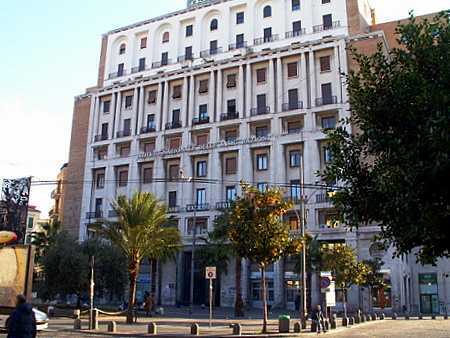 It is now a residential and business district in Rome, south of the city center. The area was originally chosen in 1930s as the site for what was to be the 1942 exposition that Benito Mussolini planned to open to celebrate twenty years of Fascism. The letters EUR stand for Esposizione Universale Roma.The project was originally called E42 for the year in which the exhibition was to be held. EUR was also designed to direct the expansion of the city towards the south-west and the sea, and to be a new city center for Rome, which was to have looked like the model in the image (above, left). Very few of those buildings got built, and the beautiful Saarinen-looking arch in the spooky poster didn't get built, either. (I don't know if Saarinen copied it from Adalberto Libera, the EUR architect who designed it, either. You'd have to ask Eero Saarinen, himself, but he's dead.) Obviously the planned exhibition never took place. Wars really mess with you. the Square Colosseum. The facade has 54 arches. G. Guerrini, E. Lapadula, and M. Romano. 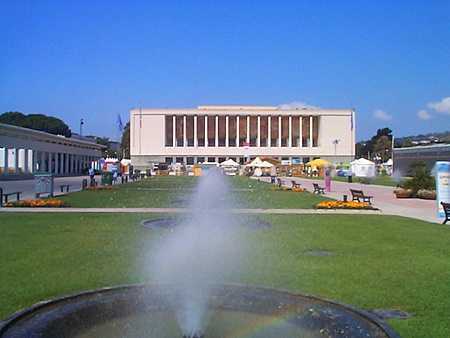 The National Museum of the Arts and Popular Traditions. If I had one day to go anywhere in Italy — well, I'd stay home — but IF... I'd go to Rome, EUR, and probably to this place. MNATP stands for Museo nazionale delle arti e tradizioni popolari (National Museum of the Arts and Popular Traditions) (image, left). It has recently been subsumed under an umbrella organization called the Museo delle Civiltà (Museum of Civilizations), a multi-museum complex that includes, besides itself, the National Museum of Ethnographic Prehistory, the National Museum of the High Middle Ages, and the National Museum of Oriental Art. (That last one is still in its historic location, the Palazzo Brancaccio. The others are all located on the premises of EUR. 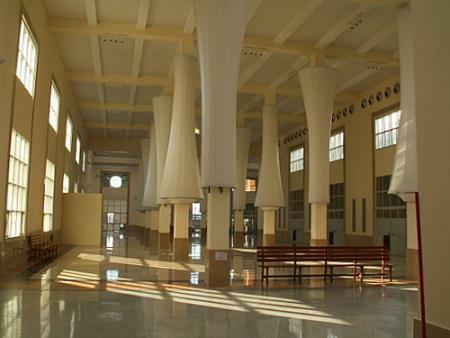 Spread over two floors and a large number of display halls, there are displays for means of transport used by farmers and shepherds, shoulder-borne floats and spires used in religious processions, period photographic displays, arrays of implements used in all phases of agriculture, displays of the way of life of shepherds including the seasonal pastoral migrations known as the tramsumanza, and harnesses and saddles used by beasts of burden. There is hunting equipment and everything about how they fished in the old days in the sea, lakes and rivers, even a display of model sailboats and one for the very special Venetian gondola. The old-time merchants, barbers, tobacco vendors, pharmacists, goldsmiths, and the craftsmen such as carpenters and smiths, they're all there. And the home — household, domestic life and traditional architecture (including household religious items) and even the most exotic traditional dwellings in all of Italy, the Trulli. And toys, rites of passage, manger scenes and marriage ceremonies. It's not finished — you have to see the musical instruments from all over Italy. Come back here. OK, go see the Colosseum. Big deal. Then, come back here. The bibliography at the end of the first item on this page contains a number of English-language sources that are equally relevant to this entry.